Garveston postmill stood what was known as Garveston Heath or Mattishall Heath or Common. The mill had a roundhouse that was described as being lately built in 1813. The patent sails on an iron windshaft drove a pair of 5 ft French burr stones in the head of the mill and another pair of 4 ft stones and jumper in the tail of the mill. A separate flour mill was horse driven. The mill house stood some 2 furlongs from the mill. Lots …. Little Snoring etc. For Particulars apply to Mr. John Crisp, Attorney at Law, East Dereham. A Compleat WINDMILL standing on a Heath called Mattishall Heath, with a Messuage, Granary & other convenient Outhouses in Garveston; all in good Repair & well situated for Trade, with 3 Acres of fine Land adjoining, now in the occupation of Robert Dexter, with a Right of Common over very large & rich Commons. Enquire of the said Mr. Crisp. Robert Dexter married Mary Murrel in Garveston on 19th October 1749. They are both buried at the church of St Margaret, Garveston- she on 1st September 1786 and he on 21st July 1805. Their son, Michael Dexter, was miller at Mattishall_Mill_Road_postmill. All that good accustomed WINDMILL in Garvestone in Norfolk, standing on the Common there called Mattishall or Garvestone Heath & now in the occupation of John Hipkin. Also a Messuage or Dwelling House in Garvestone aforesaid wherein the said John Hipkin now dwells, with the barkhouse (bakehouse?) stable, granary, horse flour mill, cart lodge, yards, garden & two inclosures or pightles of land thereto adjoining, containing together by estimation three acres (more or less). Apply to Mr. Thomas Bayes of Coston or Mr. Samuel Hipkin of Barnham Broom. All persons to whom the said John Hipkin stands indebted are requested to meet at the White Horse, in Garvestone, on Monday 19 th of this instant August at 2 o’c in the afternoon & to bring with them an account of their respective debts. And all persons who are indebted to the said John Hipkin are desired to pay their respective debts forthwith to the said Mr. Thomas Bayes, the said Samuel Hipkin or to Mr. Thomas Hipkin of Barnham Broom aforesaid, to whom the same debts are assigned in trust for all creditors of the said John Hipkin. All that MESSUAGE or DWELLING HOUSE in Garvestone next that large & extensive rich common called Mattishall Heath, consisting of … baking office, large granary, horse mill to dress flour, stable, cow house etc. with three acres of exceeding good land adjoining. Also a good WINDMILL in full trade, with two pair of French stones, a flour mill etc. in high condition. The mill is about 2 furlongs from the dwelling house. This estate has a right of common & possession may be had at Michaelmas next, as the present occupier is then going into another way of life. Enquire of Mr. Joseph Harley, the owner on the premises or Mr. Crisp, Attorney at Law, East Dereham. Unless sooner disposed of by private contract of which notice will be given. A Very good Dwelling house in Garvestone aforesaid, with a baking office, granary, stable & other necessary buildings in good repair, with 3 or 4 acres of rich land lying convenient. Also a CORN WIND MILL at a convenient distance from the said dwelling house, two pair of French stones & other going gears, horse & flour mill belonging thereto, all in the occupation of Mr. Joseph Harley, the owner. The mill is in full trade & well situated – the whole of the premises have a right of common over those large & rich commons in Garvestone aforesaid. Enquire of the said Mr. Harley or of Messrs. Crisp & Son, East Dereham. Unless previously disposed of by private contract of which due notice will be given. 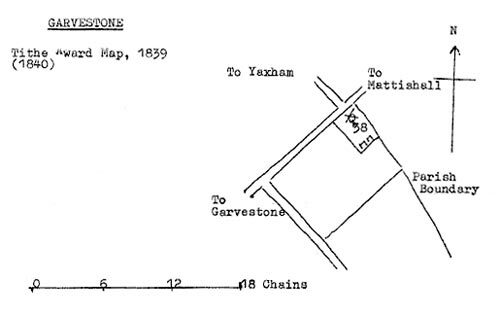 A Very desirable SITUATION in the Milling Business, consisting of a capital Post Windmill situate in Garvestone, in the county of Norfolk, with Round House & Wheat Bins lately built & two pair of excellent French Stones & also Flour Mill & Going Gears complete & in good condition, together with near three roods of Land to the same belonging. The premises are now in the occupation of William Margetson and possession may be had at Michaelmas next or sooner if required. Apply to E. & G. Cooper, Attornies, Dereham. All that capital POST WINDMILL & Round House well situated for Trade, with Iron Shaft & Patent Sails, driving two pairs of French Stones, in excellent repair & well fitted up with Flour Mill, Jumper & all requisite going gears. Also Stabling for 10 Horses, Gig, Harness & 2 Offal Houses & all other buildings in Garvestone with Yard & large Garden containing together with the sites of the buildings about 1a. 0r. 22p. in the occupation of Mr. Robert Springall. Particulars of Mr. E.R. Grigson, Solr. Watton, Mr. G.A. Carthew, Solr. East Dereham or of the Auctioneer, Attleborough. Preliminary advertisement 8 July 1848. All that Capital POST WINDMILL & ROUNDHOUSE, well situated for Trade with iron shaft & patent sails, driving two pairs of French Stones, well fitted up with Flour Mill, Jumper & all requisite going gears in perfect order. 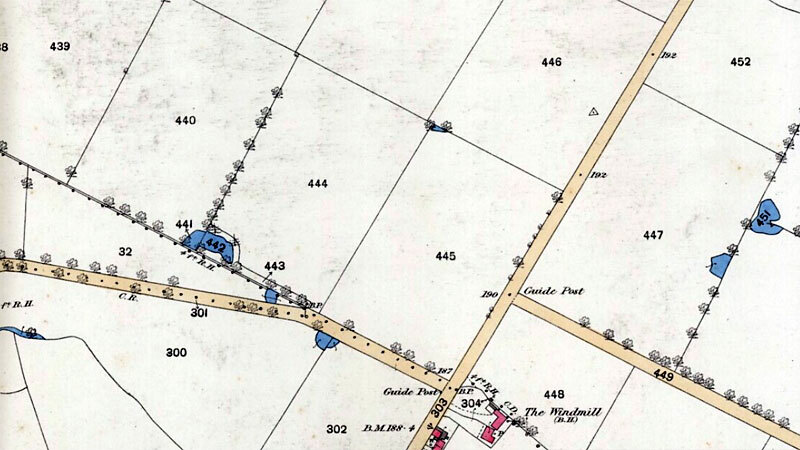 Also stabling for six horses, gig, harness & two offal houses & other outbuildings with yard & large garden containing together with the sites of the buildings about 1 rood 22 perches, now in the occupation of Mr. Archibald Brasnett. Apply to E.R. Grigson, Solr. Watton, G.A. Carthew, Solr. East Dereham, or the Auctioneers, Attleborough. Mr. John Wilden Of Garveston Mill, Norfolk has a vacancy for a Young Man who has some knowledge of the trade. To be Sold by Auction by Messrs. Salter, Simpson & Bacon at the Kings Arms Hotel, East Dereham on Friday 6 October 1865 at 5 o’c the following valuable Freehold Property in 2 lots. All that capital POST WINDMILL & ROUNDHOUSE well situated for trade, with iron shaft & patent sails, driving two pairs of French stones, in excellent repair & well fitted up with Flour Mill, Jumper & all requisite going gears. Also stabling for 6 Horses, gig, harness & two offal houses & all other buildings, in Garvestone, with yard & large garden containing altogether with the sites of the buildings about 1r.22p. now in the occupation of Mr. John Wilden, jun. Apply to Messrs. Grigson & Robinson, Solrs. Watton & the Auctioneers, Attleborough. All the capital WINDMILL & Round house situated well for trade. Also a capital DWELLING HOUSE, Pollard Houses, Granaries, Stables etc. & good Garden, situate in Garvestone. Rent low. 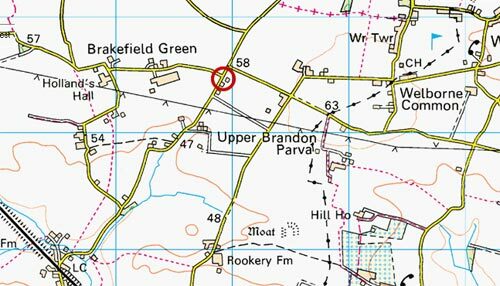 Apply to G. Greenwood, Breakfield Green, Garvestone. Within 3 miles of Dereham, 1 mile of Yaxham & 1½ of Thuxton Railway Stations. The Iron work includes – Windshaft, ten pin head, sack tackling, stone spindles, stone nuts, regulators, fork wheel & gear, stone rollers & blocks, nut & rigger, clamps, striking rods, anchors, gripes, harp irons, bearers, rollers, stays, travellers, cross, a large assortment of bolts, bars & sundry iron, lot of brasses, necks, bridging pots etc. The wood consists of 4 sails, 2 stocks (one new), head & tail wheels, 2 backs, flour mill, mill post, beams, crosstrees, crown tree, spars, uprights, cladding, vanes & about 50 lots of sundry wood. The greater portion of the above is in a good state of preservation & will be Sold without the slightest reserve in consequence of the Proprietor being anxious to have the ground cleared at once. Selling commences at 1 o’c pm. prompt. Offices, Commercial Road, East Dereham.